Delta Mailbox Sales is the most experienced and knowledgeable mailbox sales and service company on the West Coast. With the largest showroom on the West Coast, we sell every major brand of mailbox and mailbox accessories. With over 60 year’s experience, our knowledge of postal regulations is unparalleled. Another value added service we provide is installation with in the local area. If you have questions regarding our products or would like more information, please contact us. 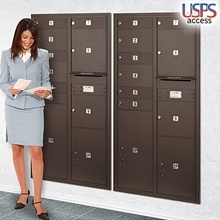 4C Horizontal mailboxes come in a wide array of styles and colors. Below is a small example of the styles and colors we carry. To see our full selection, stop by our store. Below is a list of industry leading manufactures that we support and sell. All manufacturers are officially licensed by the USPS while providing a wide variety of styles and colors that can be delivered fully assembled and ready for installation. Made of heavy duty aluminum, these units are designed to easily mount to front loading 4C mailboxes and come in a variety of colors. 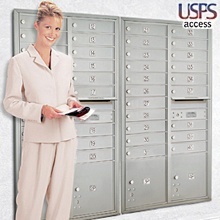 Ideal when wall space is limited the heavy duty aluminum units are designed to accommodate 4C mailboxes. Available in multiple colors.Ideal when wall space is limited the heavy duty aluminum units are designed to accommodate 4C mailboxes. Available in multiple colors.